A superb all-round bowling performance put New Zealand on the front foot and left South Africa on 236/8 when bad light halted play prematurely on the opening day of the first Test. 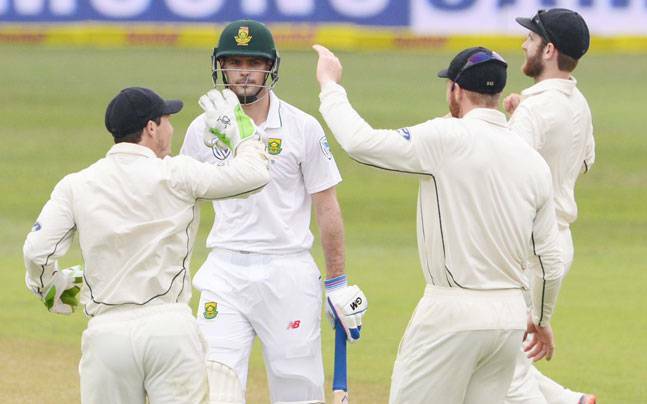 A superb all-round bowling performance put New Zealand on the front foot and left South Africa on 236/8 when bad light halted play prematurely on the opening day of the first Test on Friday. Standing in as captain for the injured AB de Villiers, Faf du Plessis won the toss and made the questionable decision to bat first at Kingsmead, despite muggy conditions and a delayed start due to a wet outfield. With New Zealand’s seamers enjoying the assistance on offer, South Africa found itself under a relentless assault of quality bowling, while their batsmen were also guilty of throwing away promising starts. Although all of the top seven reached double figures and faced more than 30 deliveries, Hashim Amla’s fluid 53 was the highest score for the hosts. While Neil Wagner finished with the best figures, taking 3-47, Trent Boult claimed two vital wickets and left-arm spinner Mitchell Santner struck twice toward the end of the day. The tone was set by Boult’s first spell, which brought the wicket of Stephen Cook and yielded just eight runs in eight overs, putting the pressure firmly on South Africa’s top order. Cook’s opening partner, Dean Elgar, fell to Doug Bracewell soon afterward to leave the Proteas on 41/2, but Amla’s boundary-laden knock led an impressive recovery prior to lunch. After the interval, it was Wagner who made the breakthrough as JP Duminy fell into a short-ball trap and was caught at deep fine leg. Amla departed three overs later, when he edged a deadly delivery from Boult through to the wicketkeeper. Du Plessis’ response was to knuckle down and scrap alongside Temba Bavuma, and with New Zealand’s bowlers tightening up as the ball became old, the scoring dried up. Once again, it was Wagner who separated the partnership as he dismissed Du Plessis for 23, but this time he had Kane Williamson to thank for an eye-catching, one-handed take in the gully. Quinton de Kock led the next fightback as his run-a-ball 33 carried South Africa to 208-5, before Santner’s double-strike put New Zealand firmly in charge. First De Kock’s thoughtless aggression saw him caught at cover, and two deliveries later Bavuma was trapped lbw for 46 whilst attempting to sweep. With Wagner nabbing the wicket of Vernon Philander late on, South Africa’s innings unraveled further. “It’s not a great position to be in to be honest with you,” Amla acknowledged. “Quite a few of us got in and didn’t manage to capitalize.